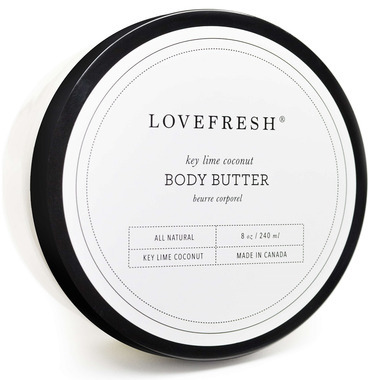 Lovefresh Key Lime Coconut Body Butter is a thick, rich and intensely hydrating formula that is packed with Aloe Vera, Chamomile, White Willow bark and Calendula extracts. Steeped in gorgeous scents (including natural lavender and lemon verbena essential oils) this body butter is absorbent and will leave your skin feeling soft, supple and smooth. The scent is very light with more coconut than lime. It is a bit firm in the container, but softens when it meets the warmth of the skin. Very nice product. I purchased this product on a whim. Was looking for something more natural with a nice light scent. I really enjoy the refreshing coconut lime smell. Feels like I'm on vacation. The butter is thick and does not irritate my sensitive skin. Have already purchased another jar.